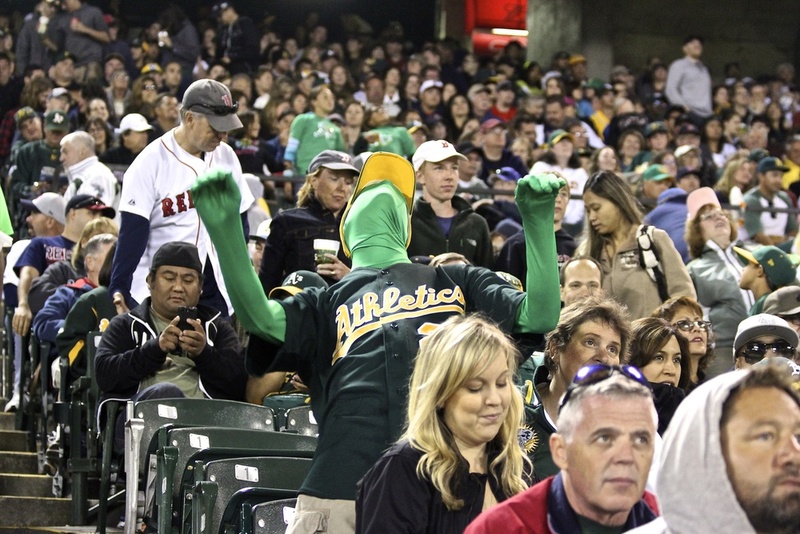 O.Co Coliseum – Best fans in baseball? Rindler and I had so much fun at the game last night that we decided to come back for more. I am glad we did because not only did we get a great free Josh Reddick jersey, but my losing streak is over! The home team finally won a game for me and the A's fans proved once again why they may be the best fans in baseball. There was a Josh Reddick jersey giveaway for tonight's game so Rindler and I got to the park ridiculously early in anticipation of the throngs of fans waiting in line. After all, the folks in Arizona lined up five hours before first pitch just for a free t-shirt, what would the lines be like for an actual replica jersey? We showed up around 3 PM (for a 7 PM start time) and were pleasantly surprised that the lines had not reached ludicrous lengths as of yet. This is the point where Rindler went from simply being my buddy to becoming my brother for life. He graciously offered to stand in line for me while I sat in the car catching up on several blog posts. For those of you who are following this site live as I make my way around the country, you are very much aware at how behind I have been getting in posting these write-ups. I may include a bit more about my day-to-day schedule in a future post, but for now you will just have to believe me when I say that I have negative time to get anything accomplished these days. The Cliff's Notes version is this: I drive to a new city, The next day I go to the game. The next day I try to write, record and edit the site and podcast. The next day I drive to a new city. Rinse and repeat. In the middle of all of that I have to pick up supplies for the road, run errands (laundry, hair cuts, groceries etc.) and try and get a massage as often as possible to prevent my back from exploding on me. The fact that Rindler offered to stand in the hot sun by himself for nearly two hours while I sat in my air conditioned car and wrote was ridiculously gracious of him. I joined Rindler back in line 20 minutes before the gates opened and met a man named Rafael and his family. I talked with Rafael briefly for the podcast. Much like the blog posts, I am very behind on the podcasts. I apologize for that, but once again if you subscribe through iTunes you never have to think about it again. It is free and when the episodes are ready they will be on your computer waiting for you. After standing in the hot sun – or air conditioned car in my case – for over two hours, we were rewarded by a pretty decent Josh Reddick jersey. There are minimal corporate logos on the sleeves, and the quality is not too bad. I have gotten many promotional items from teams over my lifetime, but this is probably the best quality free jersey I have ever gotten. Once inside, we made our way to the batting cages. Rindler took a couple of hacks in the cage while I cheered him on. We walked around the top of the stadium today, which we had avoided for the most part yesterday, where we came across a restaurant that is open to all (if you can snag a seat). There are some great views from up top, but this is a stadium where sitting in the stands is an experience you do not want to miss. I grabbed a hot dog covered in pineapple from one of the vendors on the top level and headed to my seat. This is Rindler's last game with me and I decided to get him a going away present. I signed up for the designated driver program so that I could get my free coke. I gave it to Rindler as a going away present. I am going to miss having him on tour. We were sitting along the first base line directly next to the Red Sox bullpen so there was plenty of heckling throughout the game that got a chuckle out of Rindler and I. I am always a fan of heckling if it is done well. A clever taunt that attacks a players on-field play is always welcomed. That is what I found here in Oakland. I am sure that during football season it may get a little more intense – from what I am told it gets a little blue during Raiders games – but during baseball season there are less members of the fan base that get obliterated on alcohol. Red Sox right fielder Shane Victorino was the victim of most of the attention which he laughed off throughout the game. Rindler has been with me in Colorado, Arizona, San Diego, San Francisco and now Oakland. He has not spent much time inside Major League Ballparks during his life, so seeing the animated Oakland fans was a bit of a shock to him. He had never experienced such a raucous atmosphere in his life. These fans never stopped screaming from first pitch to the final out. It was a tense four innings of scoreless baseball before the A's broke through on a Derek Norris dinger to left field. That proved to be all A.J. Griffin would need as the Green and Gold shutout the Sawx 3-0. Griffin scattered six hits over eight innings leading the way for one of the most unique entrances in all of sports. Let the east coasters have their “Enter Sandman” and Mariano Rivera, I will take Balfour Rage in Oakland every day of the week. This was quite the moment. I had already taken part in my first Bernie Lean and now it was time to witness the 36,000-plus repeatedly punch the air like a bunch of maniacs while speed metal fills the stadium air. For the uninitiated I am not quite sure how to explain either of these two acts of lunacy so I will simply tell you that you need to make a trip out to the Coliseum to see it live for yourself. It is impossible not to be energized in this stadium. My brief stay in Oakland came to a close today. This was also Rindler's last day on the tour with me and I am sad to see him go. He is flying back to Salt Lake City tomorrow morning and I will continue on with my tour. As I mentioned in the post yesterday, this may be the worst stadium in the country for baseball. Luckily the people inside have made it one of the best places on Earth to watch a baseball game. If we can figure out a way to build a new park next door to O.Co (and maybe change the name because that is a little awkward to keep typing) that can accurately capture the aural experience, the Athletics may never lose another series.